It's time to up your chip game with more flavor, more protein and more unexpected in every crispy bite! 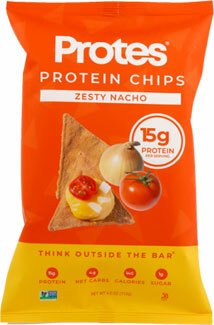 Chew on something new, delicious and healthy with Protes Protein Chips - you'll get 15 grams of healthy vegan protein in every pacakge and only 120 calories, making this an awesome anytime snack. Made with GMO-free ingredients, these tasty little thin cheesy chips are packed with plenty of vegan nacho flavor to help satsify your hunger the healthy way. They're gluten-free and soy-free, too! 1 oz. (28g) bags are $1.79 each.